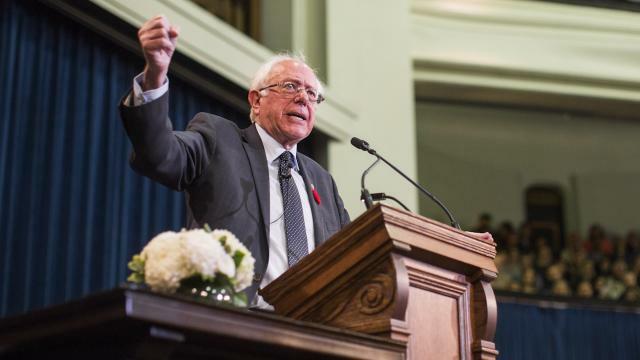 Oct. 29, 2017 11:10 a.m.
U.S Sen. Bernie Sanders says Canada’s healthcare system an innovative and strong example that the U.S. can learn from. The former presidential hopeful was speaking at an event held by the University of Toronto, which sold out within seconds of tickets being released online. Sanders, who ran an unsuccessful campaign to become the Democratic nominee for president in 2016, has been in Canada for the past week to learn more about how Canada’s universal healthcare system works. The socialist senator introduced a bill last month to bring Canadian-style, single-payer health care to the United States. He says no country in the world will have a perfect system, but that it’s his job to ask hard questions to make the American system as efficient as possible. He likened his movement to establish universal health care to the civil rights and gay rights movements of the 20th century.